How do we maintain and develop our ideals, and our own ability to live up to them? How do we actually nurture our inner lives, and how do we share this with our colleagues? We are part of the most successful alternative education movement in the world – let’s look over the fence and let Steiner Waldorf approaches in other cultures inspire us! Over two and a half days in Spring we will have an intriguing and refreshing mix of lectures, workshops and artistic activities – a source of strength for the year ahead! Please can each participant fill in a an separate booking and options forms. These can be sent in the post or scanned and emailed back to us. The programme should print as a booklet if you chose the booklet option on your photocopier – let me know if there are any hitches. On the first night we will visit Waldorf settings around the world. If you have experiences you would like to contribute please contact us at easterplanning@steineracademyhereford.eu. There will also be space to share ideas around the Waldorf 100 celebrations so please bring ideas and inspirations. We look forward to your participation and encourage all those who work in Waldorf Education to take part. 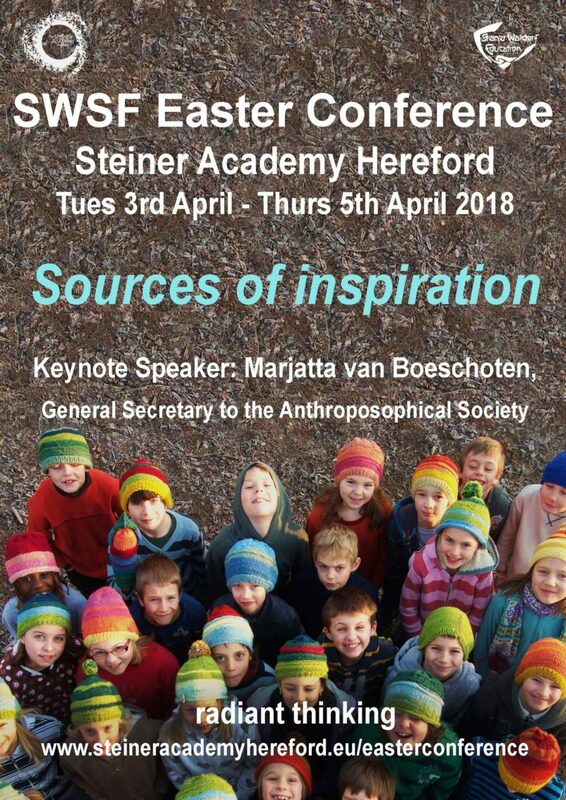 Please contact us on easter@steineracademyhereford.eu if you have any questions.